We love the idea of carrying a compact device that turns any bare wall into a movie theater. Like the makers of pico projectors have been promising us for years. But even with an impressive 80 lumens of brightness, the P4 still has a long way to go before we really get excited. In the world of pico projectors, 80 lumens with a 2,000:1 contrast ratio is as bright as you can buy right now. Using Texas Instruments DLP LED technology the P4 can project an image up to 80 inches in size on a wall. But outside of a seedily dark room, that image is very probably going to be washed out. 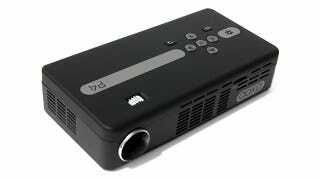 It just won't compare to your standard projector that usually boast lumens in the 2 to 3,000 range (you can't fit those in your shirt pocket though).